Airway management is a detail-oriented sport. Minor nuances of patient positioning can be essential. Or gentle laryngeal manipulation. Apneic oxygenation can improve first-pass success. Placing the pulse oximeter on the same arm as the blood pressure cuff can cause real headache. Failure to recognize and remove dentures is an enormous pitfall. An endotracheal tube placed too deep can cause hypoxemia and pneumothorax. The difference between success and failure hinges on details. Optimizing each detail increases the likelihood of success. 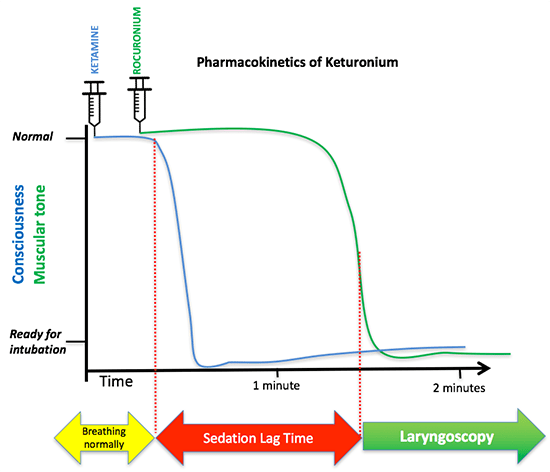 This post explores what might seem like a trivial detail: the ideal order of administration of rocuronium and ketamine for rapid sequence intubation (RSI). Let's start with a common scenario. You need to perform RSI on a man with morbid obesity in hypoxemic respiratory failure. Even with perfect preoxygenation, you can't get his oxygen saturation above 96%. What is the best order of administration of medications? (a) Push rocuronium, then push ketamine. (b) Push ketamine, then push rocuronium. before developing critical hypoxemia. 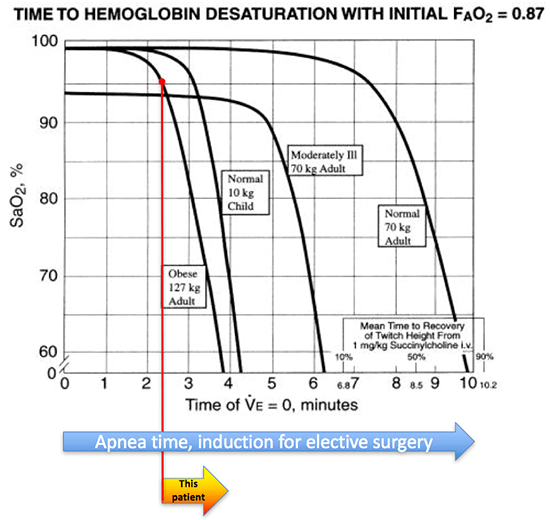 For normal people undergoing elective anesthesia, this may be close to ten minutes (blue arrow above). For this patient, the apnea time is probably closer to 2 minutes (yellow arrow above). He is starting off with a saturation of 96%, near the steep portion of the desaturation curve. Given his morbid obesity, he is likely to de-recruit, shunt, and desaturate rapidly. The sedation lag time is the interval in between onset of sedation and when the patient reaches complete paralysis. During the sedation lag time, bad things are happening: the patient's respiratory efforts drop, the lungs start to de-recruit, PaO2 starts falling, and PaCO2 is increasing. A prolonged sedation lag time will cut into the safe apnea time, reducing the time available to perform laryngoscopy. 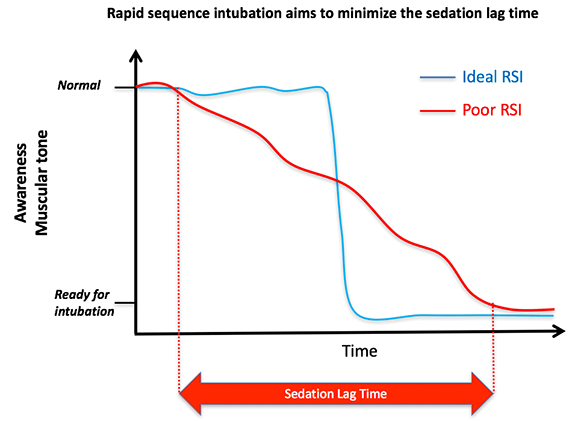 The entire concept behind rapid sequence intubation is that the sedation lag time should be as short as possible. Ideally, the patient would go directly from breathing deeply (recruiting their lungs and clearing carbon dioxide) to a state of unconscious paralysis (blue curve below). Using higher doses of rocuronium (e.g. ~1.2-1.4 mg/kg), paralysis typically occurs about 50-90 seconds after injection. Most patients will paralyze by 50-60 seconds, but shock may cause delays due to sluggish circulation of drug into the muscle. Based on this onset time, it's generally wise to wait at least ~60 seconds after pushing rocuronium before starting laryngoscopy. Before 50-60 seconds, the patient is unlikely to be adequately paralyzed, leading to a risk of vomiting. This has been discussed previously (Pearl #9). Now let's return to our initial question of how to sequence rocuronium and ketamine. It takes about 15 seconds to give the first drug and flush the IV before giving the second drug. This leads to two scenarios. In this scenario, ketamine is pushed second, but it works faster so it still tends to kick in first. Meanwhile, rocuronium will start to take effect around 50-90 seconds. The net effect is that both drugs will take effect between ~45-90 seconds. This leads to a fairly short sedation lag time. 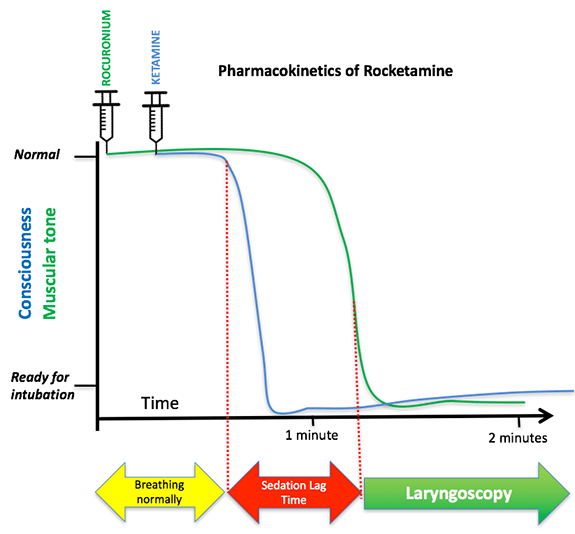 If ketamine is given first, the kinetics are as shown above. 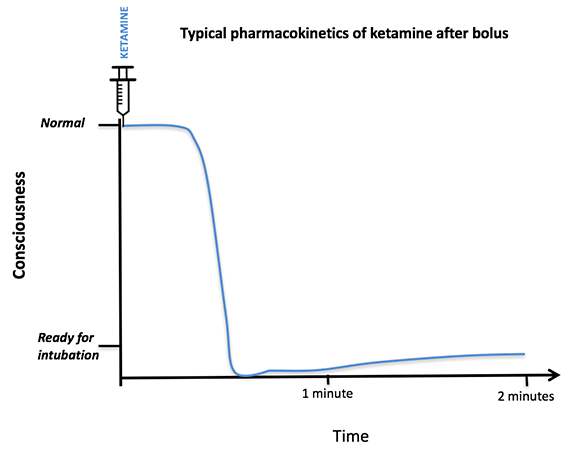 The ketamine bolus will typically cause apnea and unconsciousness in ~30 seconds. 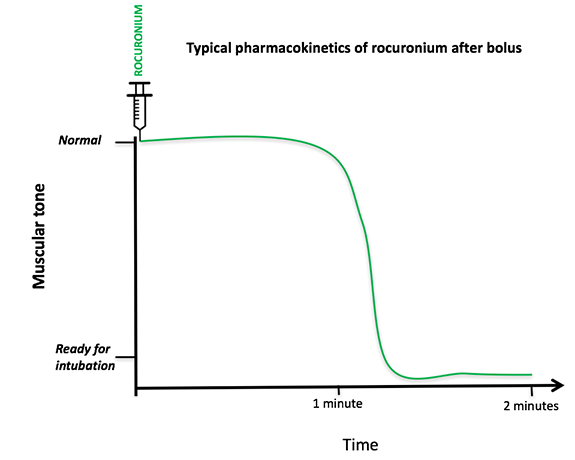 However, the rocuronium is pushed later and it takes longer to work, so paralysis won't occur until 65-105 seconds. This creates a sedation lag time of about one minute during which the patient is apneic (from the ketamine), but not paralyzed. First, as discussed above, this promotes desaturation and thereby reduces the amount of time that laryngoscopy can be performed safely. Second, there is a risk of initiating laryngoscopy after the ketamine has caused apnea, but before the rocuronium has taken effect. This is a natural mistake to make, because the patient is apneic and may seem to be paralyzed. However, the patient isn't truly paralyzed at this point in time, so they may still vomit and aspirate. On a related note, imagine a patient who is a bit anxious prior to intubation. Perhaps they should receive a dose of midazolam as an anxiolytic, to reduce the emotional stress of the peri-intubation period? Tachypnea (may reduce pre-intubation PaCO2, preventing respiratory acidosis later on during the apneic period). Deep breathing (causes recruitment of lung bases, improving oxygenation). Many standard textbooks recommend pushing the sedative prior to the paralytic. The principle guiding this sequence is that we would never want a patient to be paralyzed without sedation (anesthetic awareness). Hopefully this discussion has explained why pushing rocuronium immediately prior to ketamine won't cause anesthetic awareness. Not giving adequate sedation after intubation with rocuronium (the rocuronium out-lasts most sedatives provided during induction, so sedation must be re-dosed aggressively until paralysis wears off). Inadequate sedative doses in patients with a history of alcoholism and/or substance abuse (causing them to be refractory to standardized sedative dosing). The cornerstones of achieving adequate safe laryngoscopy time are adequate preoxygenation and apneic oxygenation. Although critical, these have already been explored extensively here. Patients who are awake may be encouraged to intentionally hyperventilate immediately preceding induction. The main effect of this is probably to drop the pre-induction PaCO2, thereby minimizing hypercapnia (3). It is possible that hyperventilation could improve recruitment and oxygenation as well. Perhaps the most powerful strategy to reduce desaturation is noninvasive ventilation during sedation and paralysis. In short, this consists of attaching the patient to a BiPAP machine with a backup rate. As soon as the patient becomes apneic, the machine rate will immediately initiate gentle, controlled ventilation. Continuous administration of positive pressure avoids de-recruitment. Compared to manual ventilation, this has the advantage that it is seamless and provides perfectly-controlled breaths (unlike adrenergically-charged operators who tend to bag too hard). Apneic ventilation using BiPAP generally works nicely, but it does depend on the ability to maintain a patent airway (e.g. gentle jaw thrust provided by the operator as the patient becomes sedated). There is no guarantee that it will work perfectly (2). Therefore, the best overall strategy may be to combine this with a rocuronium-ketamine sequence such that if the apneic ventilation fails, then the apneic time will still be limited. Induction with high-dose rocuronium (e.g. 1.2-1.4 mg/kg) followed by ketamine. Adequate preoxygenation & apneic oxygenation. Voluntary hyperventilation before induction (if possible). In select high-risk patients, BiPAP with a backup rate may be used to provide positive pressure and gentle, controlled ventilation throughout this entire time period (VAPOX). Fresh commentary on this post by Scott Weingart here and Pharmacy Joe here. Huge thanks to Scott, Joe, and many other experts who have offered opinions here and on those sites. This is a true demonstration of FOAM, wherein open-sourced collaboration and debate has taken this beyond something that I could have created alone. Weingart & Levitan, Preoxygenation & desaturation prevention, Ann Emerg Med 2012 (free). For example, Emergency Medicine Procedures by Reichman EF, 2nd edition, 2013, page 49. Note that even if the airway occludes, this strategy still works fairly well. Airway occlusion while on BiPAP will trap ~100% oxygen at positive pressure within the lungs. The positive pressure of the trapped oxygen will tend to keep the lungs open, preventing derecruitment. Unfortunately, airway occlusion will cause cessation of all ventilation, so PaCO2 will rise more rapidly than it would if the airway was open and there was ongoing ventilation. Thus, airway occlusion is potentially more problematic with regards to ventilation than oxygenation. In a situation where apneic ventilation was very important (e.g. severe metabolic acidosis), placing a nasal trumpet could be considered to improve ventilation during sedation and paralysis. Peri-intubation hypercapnia probably isn't a big issue for most patients (with some exceptions including patients with metabolic acidosis or elevated ICP). However, it is possible that peri-intubation hypercapnia causes peri-intubation hypertension in many patients (however, again, this generally isn't a big problem). Scott Weingart and I do VAPOX slightly differently. Either method will work fine. I would use whichever method you are more comfortable with (depends on which machines you use and how you generally set them up). These are all great points. I think it’s important to emphasize that drug onset is unpredictable (note there is a STANDARD DEVIATION in the onset times) and you have to make a risk/benefit decision each time. 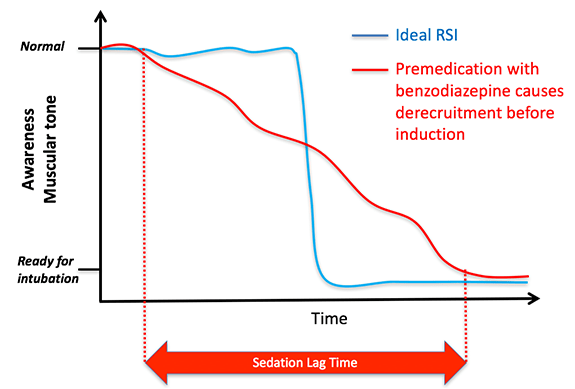 I am not sure we should standardize roc before sedative (maybe only in those who really can’t afford the extra few seconds…and I admit that some can’t). 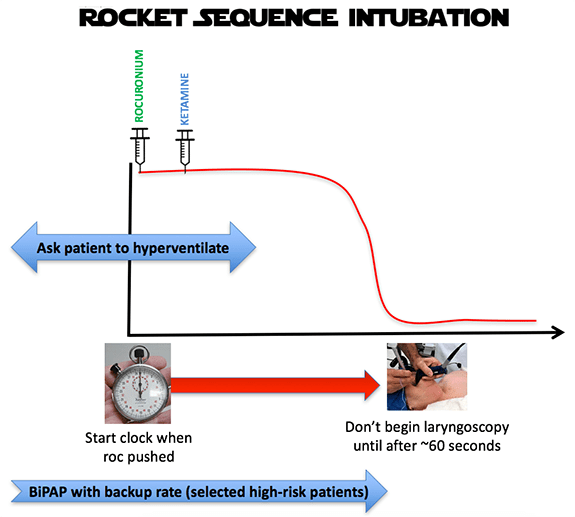 As I noted above, even if you push both as fast as possible, the onset of roc first can lead to an ugly scene that I think should be reserved for those who can’t tolerate 20 seconds (or so) of apnea time. Ketamine and rocuronium have not been tested for compatibility in the same syringe. Generally, we avoid it if we don’t know. ISMP recommends against mixing more than one med in the same syringe for IV push, except by the pharmacy (http://www.ismp.org/Tools/guidelines/ivsummitpush/ivpushmedguidelines.pdf). The situation it most commonly arises for is ketofol. Based on kinetics, and ISMPs recs, I advocate for separate syringes for these two meds as well (https://www.ncbi.nlm.nih.gov/pubmed/23331657). I’ve thought about this concept of sedation lag. While it can be problematic with other sedatives, I think Ketamine is the perfect drug for this problem. My solution in a patient in whom those extra seconds can make a difference has been to simply push Ketamine slow, then slam in the paralytic. Ketamine should rarely cause apnea with slow push (we do this all the time for procedural sedation). So, slow Ketamine push to dissociation (unaltered spontaneous respiration), then fast paralytic push. No unnecessary, compounded apnea time. Excellent point Sam. Agree that if ketamine is given before rocuronium it should ideally be given slowly to avoid apnea. I’ve done this several times, generally within a delayed-sequence intubation (DSI)-type strategy with success. My only reservation about ketamine-first is for patients with severe hypoxemia who are struggling to breathe, sedation may cause them to relax and struggle less, leading to desaturation. Ketamine when given slowly doesn’t cause apnea, but these folks will often have reduced breathing effort after sedation which can work against you. This is one of the reasons why I prefer the faster acting succinylcholine. Succi is imho totally contra indicated in the critical patient. Hd roc is almost as fast acting. can you please justify this broad, sweeping and totally wrong statement? I think the FOAMed community has done a great disservice by its scorn of succinylcholine, which does act faster and has very rare true contraindications. I’m with you on this one. Admittedly, I’ve probably only administered Ketamine less than 100 times. But apnea? Really? Maybe I’ve never pushed it fast enough. . .
And I can’t count the number of times I’ve pushed Sux (hundreds) and have NEVER experienced clinically relevant hyperkalemia. So to Stephan who says it is “totally contra-indicated in the critically patient” – well, wow I must have really harmed a lot of patients. And despite being the ED QA director for 6 years and the ED medical director for another 2+ years, my ICU colleagues have never informed me about all the patients I or my colleagues have killed. Maybe they know I would feel bad and are trying to protect me. . .
That said, getting Sux-induced myalgias. . . well, sux. .
Those papers show that high dose rocuronium has a “similar” onset time although if you look at the raw numbers sux is still quite a bit faster (34 versus 54 sec at the laryngeal adductors, 56 versus 65 sec at the adductor pollicis). The Cochrane review also found in general that succinylcholine is faster although high dose roc is pretty close. I’ve never seen a paper finding that roc is as fast. And the contraindications for sux are quite rarely encountered. They do include things like neuromuscular disease, hyperkalemia (though not renal dysfunction) and history of MH. Critical illness is not a contraindication. You also lose your neuro exam for quite a while when using rocuronium, and it’s been shown that patients receiving long acting paralytics are rarely provided appropriate sedation in the ED. I completely agree. Sux has gotten a bad rap for no good reason at all. It may be worth considering why “RSI” in the first place? If we consider hypoxia / hypotension as the biggest predictors of airway-related death, why not prioritize avoiding them instead of prioritizing avoidance of passive regurgitation / aspiration (an infrequent event with limited morbidity) as advocated in the “RSI” approach? This may involve EARLY administration of ketamine to allow optimal pre-oxygenation with positive airway pressure / PEEP, continuation of oxygenation during the apneic period with positive airway pressure / PEEP, and provision of nasal cannula oxygen during laryngoscopy. All outside-of-OR intubations occur in sick patients, many (most?) of whom have shunt physiology. Providing PEEP before and during the apneic period prevents atalectasis and helps maintain oxygenation, prolongs the safe apnoeic time, and makes the time to intubation after administration of muscle relaxant almost irrelevant. The priority is avoiding hypoxia, as long as the patient is not hypoxic, they are safe. When to use RSI is a great question, for example should we be using awake intubation for severely hypoxemic patients? This is an important question but a bit outside the scope of this post. Nice job, sounds like you saved this woman’s life. Did she have any recall? I’d bet that she didn’t. I’ve been doing roc-ketamine for years. Some patients aren’t 100% dissociated before paralysis, but they are close enough to dissociation that they don’t remember anything and are probably well analgesed (ketamine is a good analgesic). Also note that if you start laryngoscopy at 50-60 seconds, it’s probably 60-75 seconds before you’re causing any real stimulation. I’ve yet to have a patient report awareness of intubation due to this sequence. I don’t use sux, but the evidence seems to suggest that onset time is clinically equivalent between sux vs. high-dose rocuronium (e.g., http://europepmc.org/abstract/med/7902034, http://europepmc.org/abstract/med/7978469). We sometimes administer 10-20mg lidocain in to the line before giving propofol, because a lot of patients say injecting it hurts. ( OR) Might work for roc, too. That dose is more or less harmless and delivers good veinous anesthesia in my experience. Thanks for the Post! I got one comment concerning Roc: In my experience a Push Dose of Roc is VERY painful for the Patient, This should be concerned. Maybe we are using a different preperation of Rocuronium in Europe?! Even a consutant told me that she experienced sore pain during injection (too fast inj. after Induction) when she was anaesthetised. Second thing: You wrote about Rocuronium “Most patients will paralyze by 50-60 seconds, but shock may cause delays due to sluggish circulation of drug into the brain.” Should be …into the muscle..?! Thanks, I fixed the brain/muscle error. Must admit that I wasn’t aware of rocuronium-induced pain. However, regardless of the order of rocuronium vs. ketamine, the patient will still be conscious while receiving rocuronium (so this won’t resolve the rocuronium-induced pain issue). What does de-recruit mean? Never heard that term before. An induction dose of ketamine (e..g. 1.5 mg/kg) should cause dissociation and loss of any awareness. The only exception I’ve run across were a few patients with alcoholism who seem resistant to ketamine (no data on this, just my own observations for whatever that’s worth). Regarding your point about alcoholism ( or anyone with an increase MAC), there may be an opportunity to add in adjuvant induction agents to smooth it out? PS I used Ket then ROC just the night prior to my initial post on a 50 y/o patient with life threatening asthma. It worked very well. we usaually start with low dose of paralytic (15-25% of the dose), then we give the sedative followed by rest of paralytic. i think this works well. Very interesting concept. Looks like we should give it a try. We usually use high dose sufentanil ( sometines plus midazolam/ etomidate)/ roc for true rsi or in hypotensive patients hd s-ketamine and roc( both 2mg/kg patient) in a modified dsi. I’m surprised you still use etomidate; your patients sound like they could well be at risk from etomidate-induced adrenal suppression (http://www.medscape.com/viewarticle/773598). Also, bag mask ventilation will provide much better pre-oxygenation. I’m not sure I would consider NP or NRB/HM pre-oxygenation “conventional”. Great post, thanks for this Josh. The comment about standard deviation got me thinking & I ran a 5000 patient Monte Carlo simulation using the onset & standard deviation of roc from one of the studies that often is quoted as proving roc is about as fast as sux, and the onset & standard deviation from a study with ketamine. Clearly, there are patients when the sedation lag time risk is greater than the risk of anesthetic awareness. 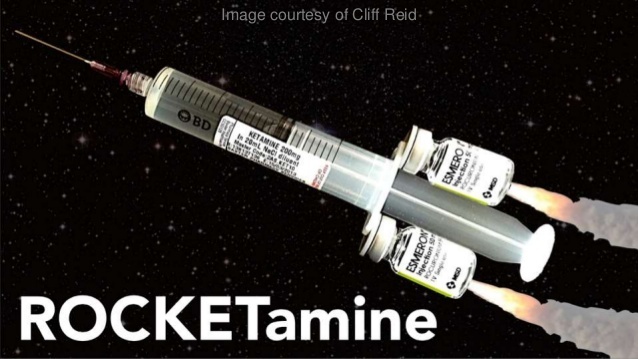 But I suspect after I crunch all the numbers not many people will want to use “rocketamine” as the default choice. It’s not valid to analyze this using a Monte Carlo simulation. This simulation assumes that the onset time of roc and ketamine are independent, whereas in reality the opposite is true. Patients with lower volume of distribution and good perfusion will have fast onset.time of roc and ketamine. Patients with sluggish perfusion will have slower onset of both drugs. Pharmacokinetic parameters will tend to affect the onset time of both drugs in the same way. Thus, it is biologically implausible, for example, that a single patient would have unusually *fast* onset of rocuronium but unusually *slow* onset of ketmamine. As such the simulation will greatly overestimate the incidence of awareness. This is a tricky topic. I’m still not sure that there is a single right/wrong answer to it (like most things in medicine, it probably depends on the clinical scenario). However, the robust debate on EMCrit and your site have certainly helped explore all possible angles on the problem. Thank you Josh, I agree on all points – highly dependent on the clinical scenario and FOAM is a great thing! If only we had FOAS (Free Open Access Spectrophotometry) as well for the syringe issue! I am a bedside nurse in an ICU where it seems to be common practice to “keep paralytics on standby” (Rocuronium) if intubating with general anesthetics/sedatives is insufficient. Often times I will see providers make their first attempt at DL after pushing Ketamine, Etomidate, propofol or simply midazolam with fentanyl and fail. They then want the paralytic pushed for the second attempt which usually is made within 30 seconds of pushing the roc… seems pretty pointless. I will be sharing this article with some of my coworkers!